First Home-Grown Tomato of the Year! - JP loves LIFE! Last night, I skipped part of the Tuesday night agricultural social media ritual known as #agchat. It’s cause Tuesdays in June & July are community pool night at my sister’s house! It’s something not to be missed, at least not too often. My sister loves her backyard — the pool, the garden, the grill and having people over to enjoy all of them is “her thing” in the summer. Actually, it’s a family thing cause everyone joins in. Small spaces, trying to fully utilize it. Lots of the things the family uses — tomatoes, herbs and grilling veggies seem to get the most space. Water guns serve as irrigation at times. LOL. 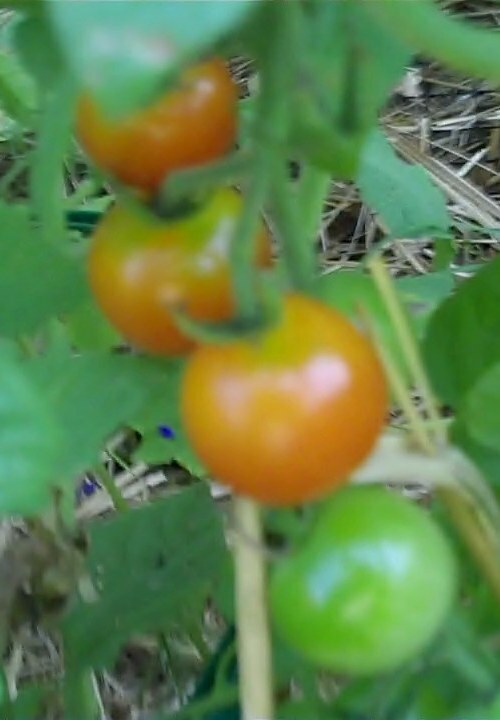 Tomatoes fresh from the vine…. nothing like that. Anyway, here’s the video…. I hope you enjoy it! And whether you grow your own tomatoes, buy them at a farmer’s market or grocery store, lets all celebrate that tomatoes are becoming in-season in so many areas. And take a minute to thank a gardener (thanks Leslie!) or thank a farmer! Watching this video reminded me I need to get out there and trellis some tomatoes and pull some WEEDS! I love having periodic video of the garden. Someone said when they got here Tuesday, “Wow! It’s really taken off!” I just don’t notice I suppose sitting out there every day. WOW! That salad looks incredible!